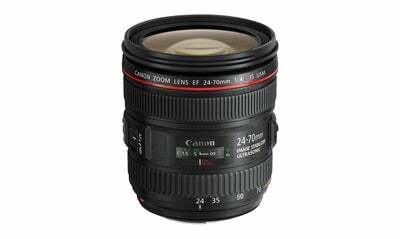 Just over two weeks ago, Canon announced the EF 24-70mm f/4L IS USM and EF 35mm f/2 IS USM lenses. Since the launch of these new lenses we’ve been interested to find out how different the EF 24-70mm f/4L IS USM lens feels compared to Canon’s EF 24-70mm f/2.8L II USM lens. During a recent meeting with Canon, we laid hands on very early samples of both the EF 24-70mm f/4L IS USM and EF 35mm f/2 IS USM. Our first impressions of these lenses can be found below. One of the first things that strike you about this standard zoom is its size. Significantly more compact than Canon’s EF 24-70 f/2.8L II USM, it’s also a much lighter lens. Where the faster f/2.8 variant weighs a fraction over 800g, this f/4 version has been designed to be less cumbersome, weighing just 600g. Although 200g may not sound like much, when you hold each lens in either hand, the difference is instantly recognisable. If you were to shut your eyes and guess as to which lens was which based on weight and feel alone you’d guess right each time. It might not be as heavy, but the EF 24-70mm f/4L IS USM has an excellent build quality that we’ve come to expect from lenses that feature the red band. It feels more portable, and though it is a stop slower than the EF 24-70 f/2.8L II USM, it feels like it’s a lens that will really benefit photographers who like to work with as light a kitbag as feasibly possible. It’s expected to be a hit with pro’s looking for a lighter 24-70mm alternative and amateurs who may not want to pay out £1999 for the EF 24-70 f/2.8L II USM. At the time of writing, the f/4 is £500 cheaper than the f/2.8, though we can expect the price of the f/4 to drop a little in coming months after it’s officially on-sale. During our brief hands on, the lens locked onto subjects without any sign of hesitation or hunting when used in combination with the EOS 6D. Our favourite new feature has to be the new macro function. My pushing a new macro switch forward, or away from the camera, there’s the option to twist the lens to a macro function, allowing a maximum magnification of 0.7x. Some may question the initial pricing of the EF 24-70mm f/4L IS USM, but when you realise how close this lens also allows you to focus, it’s much like having two lenses in one. We really were amazed by just how close you can focus and it’s going to be a great introduction to those who may have never attempted macro photography before.